7,790 COLOURlovers viewed this page and think citysafari would win gold in an awesome competition. 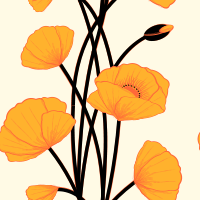 "can you say california" - golden poppies! thanks so much! and it started with an outstanding pattern! thanks! and isn't this a great site! thanks! so do I! thanks for visiting! thanks! I love oranges and yellows (but it needs to be the right yellows), and this just happened to come together very well. ...I'm Californian, too! where are you? LA, we don't have as many of the poppies out here. Credit must be given to citysafari & yoksel.